what is that fabric around the blocks? I want the frameless kind...? what is that window frame around the shirt? 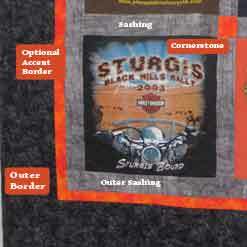 As one of the premier t-shirt quilt makers in the country, we have always included sashings and cornerstones as part of your quilt experience. These simple details are hallmarks of a professional quilter, and we have always offered you the best product for the best price. Sashing is the quilting term for the fabric that goes around each t-shirt block. Our signature quilts that we have been creating for over 10 years features 'sashing' as a standard feature. Most other t-shirt quilt makers charge extra for this. Cornerstones are the squares at the intersections of the 'sashings'. Again, our standard quilts include this at no additional charge. WHY would I want sashing? Sashing helps stabilize the quilt top. The fabric that goes around each tshirt keeps that tee shirt from stretching. Doesn't matter what you hear from the tshirt quilt makers that don't include sashing, tshirts by nature STRETCH! Don't believe me? Tug on your t-shirts. I bet they stretch in all directions. So, the Frameless/No Sashing option is more economical and you can use a few more tee shirts from your collection for a reduced price. * If you would like this type of quilt, we still offer a high quality QUILT rather than a blanket. Our 30 plus years experience quilting will give you an excellent quilt. You still might pay a little bit more, but we promise - this QUILT will last a lifetime.